During the Victorian era yachting had developed at Teignmouth to the point where Teignmouth Corinthian Sailing Club was formed in 1886. The club’s first clubhouse was built in 1891 at the end of the Pier. 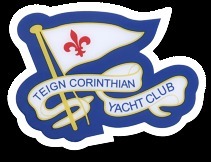 This continued in use until 1946 when co-incidentally, and with the influx of members with ‘motor cruisers’, the club changed its name to Teign Corinthian Yacht Club.